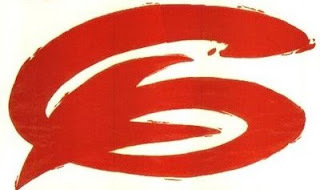 The Beatnuts' logo - which first appeared on the cover of their breakout 1993 EP Intoxicated Demons - was detourned from the Reid Miles-designed cover for Hank Mobley's essential 1965 Blue Note LP The Turnaround. Simple, red, direct and eminently tattooable - it's everything a good logo should be. It's also open to interpretation; is it the forked tail of deviltry? Is it a rudderless life suddenly seized by the blessing of pragmatism? Pick your poison. Designed by anarcho-punk band Crucifix (detourned from Gerald Holtom's original 1958 symbol of the British nuclear disarmament movement) for their 1983 album "Dehumanization," issued by the Corpus Christi label, the sub-label owned by Crass. The mushroom cloud is here used as a wise and incisive presentation of the modern cross on which we were all hellbent on crucifying ourselves back in 1983. Here's Crucifix live in concert before they broke up in 1984. If I'd had to perform in front of a lethally bored audience like that one, I'd want to hang it up, too. Here's a faintly illuminating interview with Sothira Pheng, Crucifix's fiery Cambodian lead singer; it apparently dates to just before "Dehumanization" was issued. 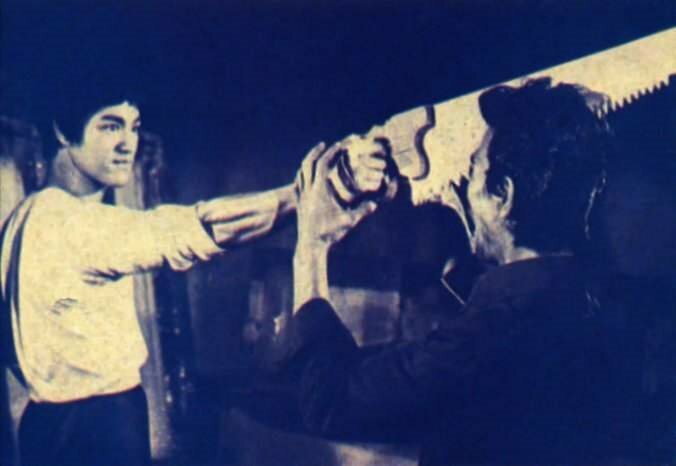 Pheng has some entertaining things to say about the episode of "Quincy" in which the punk rock menace was "revealed." I wonder if any other punk bands were interviewed about that particular network television event at the time. Here's another clip, riddled with clichés as it is, with traditional heavy William Forsythe playing the lead singer of Pain on the "CHiPs" punk rock episode. Another ridiculous scare attempted by squares. Time passages. "Peace or Annihilation" - make your choice now with this stylish coffee mug! Designed by Prong lead singer and guitarist Tommy Victor in 1987. They're on tour again, as of this writing - playing impressively small venues, which just seems really bizarre because, well, they're Prong. Metal seems like it should be performed out in an amphitheater or at an observatory; there's a regal aspect to that particular music that remains underutilized. Call it "Live (Voltage) at Red Rocks." I've posted more here in the past two weeks than I have in the past two years. I don't know whether to celebrate or be ashamed. I'll just pass the entertainment savings on to you and leave it at that. I had hoped to get this up by 3:33 p.m., but, well, you know. Imagine beating a dead horse for the rest of your life. 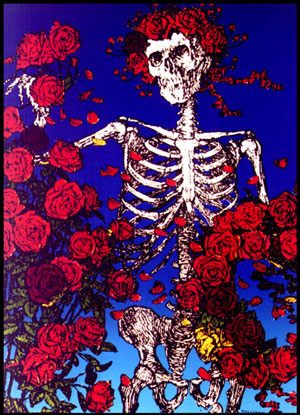 The Grateful Dead had three main logos that accompanied them through their long journey in life. 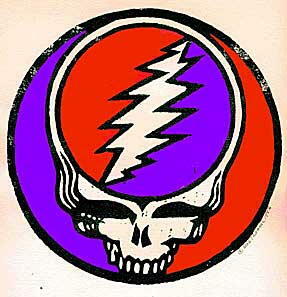 The "Stealie" skull-and-lightning was designed by Owsley Stanley and Bob Thomas in 1969. 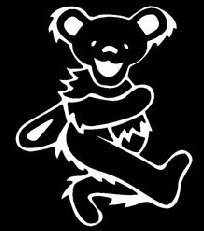 Alton Kelley and Stanley "Mouse" Miller designed the flower skeleton in 1971, while Bob Thomas designed those famous dancing bears in 1973. Designed by drummer Billy Martin for the cover of Medeski Martin & Wood's 1995 release "Friday Afternoon in the Universe." One of their best-known songs is "Uninvisible." Also in the band: pianist John Medeski and bassist Chris Wood. They're another band about which it's hard to believe that it's been 20 years since they've been around. I seem to recall this particular logo represents a martini glass. I hear stories and over 20 years they're either etched in acid in the steel of my memory or they crumble like photographs made entirely of volcanic ash just by my thinking of them. 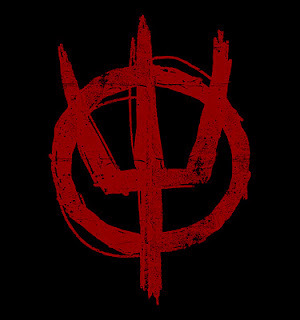 F.Y.P's logo was designed by band founder Todd Congelliere for the band's second demo in 1988. This particular version in that lovely shade of almost-IKB comes from the "Extra Credit" EP from 1991. Congelliere: "I just wanted something that had something to do with (the number) 5, 'cos the band was called 5 Year Plan." Begun in a bedroom in Torrance in the late '80s, F.Y.P was conspicuously lighthearted, an ironically stark contrast to the almost 15 years of that pragmatically grim SST work ethic that seemed to become shorthand for punk rock in the South Bay area of L.A. in the '80s. It wasn't as intense as what happened to Rocco Roll of The Absentees, though. 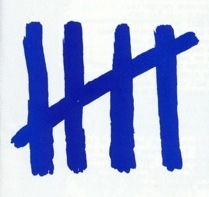 Designed by California artist Ron Cameron in 1991 and appropriated by Dominic Ayre for Plastikman in 1993. 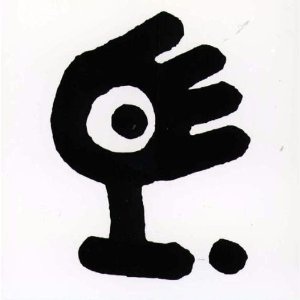 There's been a considerable amount of debate as to the provenance of this logo over the past twenty (!) years - Ayre was accused of filching it from some mysterious skateboard artist until Cameron himself helpfully cleared everything up here: "I did this for my own skateboard company called Strike (through Acme Skateboards), for the “Street Worker” model in 1991. Someone re-scanned it and sold it to Richie Hawtin in 1992 and claimed ownership. Richie found me around 1997, and everything was settled all cool-like. I’ve been friends with Richie since, and Plastikman is re-issuing the 1st LP in 2010, with actual plastic toys of this character - one for each song title, 12 total. "